[Single] 2nd "Naniwa no Haniwa"
Takoyaki Rainbow’s new single Naniwa no Haniwa (なにわのはにわ) will be released on March 19. 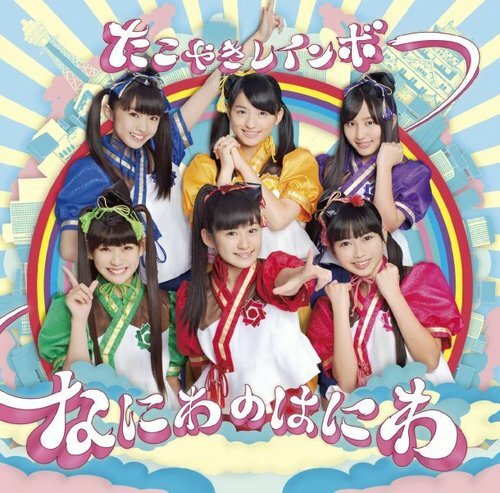 This is the 2nd single from Takoyaki Rainbow. The title song is produced by Maeyamada Kenichi, aka Hyadain, who worked with Momoiro Clover Z. It is an energetic song. 2 versions are available. Each CD contains 3 songs. The 3rd track is different for each one of them. In addition, the idol group will hold a live tour from February 2 to March 23 in Hyogo, Tokyo, Osaka, Fukuoka and Aichi Prefectures. It seems that "Chanto Hashire" has a good reputation amongst fans. Do you know how to buy this single? Can't find it on HMV or itunes. This single is sold only at the Kansai area. Seriously?! What is their management thinking?! I tried to look for them in CDjapan but nothing showed up in the search except for the Stardust 3B. how much their single's price in kansai area? 2nd single "Naniwa no Haniwa"
In Japan, the sales tax to be raised from 5% to 8% in April.